Last weekend, the Diocese of Limerick introduced its new pastoral strategy, which will see parishes co-operate and teams of priests minister within designated pastoral units. On Sunday, Mass-goers in parishes across Limerick learned of the new arrangements in a pastoral letter from Bishop Brendan Leahy that was read out at all Masses. The new arrangements will mean that each of the priests in a pastoral unit will be a ‘co-Parish Priest’, and there will no longer be one single parish priest per parish but several priests working in all of the parishes that are linked as a pastoral unit. “In devising these pastoral units, I have travelled the Diocese and consulted with many groups of clergy and laity about this new arrangement,” Bishop Leahy said. He said that during Limerick’s 2016 Diocesan Synod, important signposts had emerged to guide the diocese in the next steps it needed to take. “One of these steps is the development of ‘team ministry’. In the past two years we have worked on this and are now at a point of arranging our Diocese into Pastoral Units with teams of clergy ministering in each unit,” the bishop explained. He said each pastoral unit will have its own character, but some things will be common to all of them. In each pastoral unit priests will work much more as a team, meeting together regularly to plan and review their ministry in the unit. At the weekend, instead of the same priest celebrating Mass in the local parish, the priests of the unit will move around the parishes of the unit to celebrate Mass in the different churches. There will be one Pastoral Council per Pastoral Unit made up of members of each of the parishes of the unit. Each parish will have its own smaller working group, which might be called a parish pastoral co-ordinating group or action group or animation group. “The main goal in establishing Pastoral Units and Team Ministry is greater co-operation between parishes. The hope is that there will be a greater critical mass of energy, competencies and lay volunteers at the service of a number of parishes,” the Bishop of Limerick said and cited the Irish saying: Ní neart go cur le chéile (our strength lies in unity). The Bishop said that the establishment of the Team Ministry Units had been necessitated by the “considerable decline in the number of priests”, the increasing age profile of priests and the increasing demands, bureaucratic and otherwise, on priests today. Dr Leahy acknowledged that the radical new changes come at a challenging time for the Church in Ireland. The revelations of the clerical abuse scandals and cover-up had “shocked many and disturbed” their faith while the result of the referendum on the Eighth Amendment had also been a difficult moment for many regular church-goers. While change wasn’t easy, the Church constantly needed to reform and renew itself, he stressed. 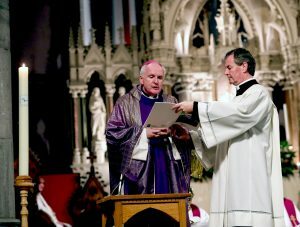 “Priests will always be necessary,” he said but added that the new arrangements for Limerick were not just about responding to the decline in the number of priests. “We need to promote arrangements that encourage greater co-operation and exchange between parishes,” Bishop Leahy said. Responding to the question as to whether it would not be easier to bring priests in from abroad, Dr Leahy recalled how at the Synod, it had been agreed that while it would be good that a few priests might come from abroad to help out, it was also recognised that for many reasons it was not a real long-term solution to the problem of the shortage of priests. “We have to learn new ways while, of course, praying for more vocations from our own Diocese to the priesthood and religious life,” he said. He added that it was also true that the Church is seeing a deep discovery that every baptised person has a vocation.